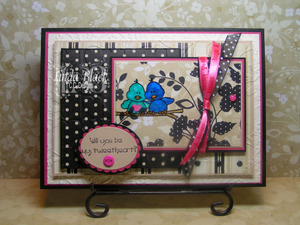 I did this card for a Sketch Challenge over at Splitcoaststampers. Also, just got this wonderful Close To My Heart Silouette Designer Paper today and just had to use it. I had a class here tonight and we stamped on transparency - so I have transparencies on my brain - I told the girls to watch out we'll probably be adding lots of them to our upcoming classes. Anyway, these two little sweeties are stamped on a transparency then colored in with Close To My Heart Markers. You have to color them several times in order to get the ink to look ok. TFL - love playing the sketch challenges! VEry, very cute!!! I love that paper.